VENTURA, Calif.— The U.S. Fish and Wildlife Service today announced the successful recovery of three out of four unique subspecies of island fox on San Miguel, Santa Rosa and Santa Cruz islands, removing them from the endangered species list. 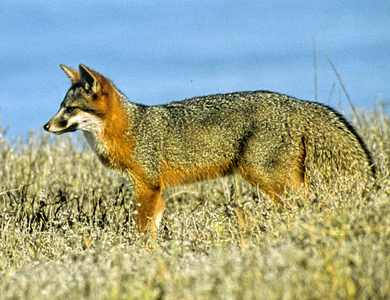 The agency also changed the protection status of the Santa Catalina Island fox — the fourth subspecies — from “endangered” to “threatened” to reflect its status improvement. Island fox photo courtesy National Park Service. Photos are available for media use. "Because they evolved separately on the islands for 16,000 years, these adorable little foxes are some of the only carnivores endemic to California,” said Jeff Miller with the Center. “They were on the brink of extinction just 12 years ago when they were protected under the Endangered Species Act. Now, thanks to successful reintroduction and recovery efforts, numbers of foxes are way up and threats have been reduced." California's diminutive Channel Islands foxes have been impacted by a cascade of ecosystem changes caused by introduction of invasive species and pesticide use, as well as disease. In a classic case of unintended consequences, island fox numbers plummeted in the late 1990s largely due to a sudden invasion of nonnative golden eagles. Golden eagles, which eat the foxes, were able to colonize the islands because the now-banned chemical DDT wiped out the islands’ native bald eagles — which eat fish, not foxes. The introduction of nonnative pigs, deer and elk to the islands provided additional prey for the invading golden eagles, and livestock reduced fox habitat. Island foxes have also been very vulnerable to canine distemper transmitted by domestic dogs. Island foxes were protected under the Endangered Species Act in 2004 and populations have increased following a captive breeding and reintroduction program, successful efforts to remove feral pigs, and control of predators. The National Park Service, Nature Conservancy and U.S. Navy have successfully removed the nonnative animals from the islands. The banning of DDT in 1972 allowed the return of bald eagles to the islands, and relocation of golden eagles to the mainland spurred recovery of the island foxes. From fewer than 100 foxes on three islands just 15 years ago, the foxes’ populations have grown to more than 700 on San Miguel Island; 1,200 on Santa Rosa Island; 2,100 on Santa Cruz Island; and 1,800 on Santa Catalina Island. Island foxes on Santa Catalina Island, the only island with a permanent human population, will retain protection as a threatened species because of the ongoing threat of disease. Canine distemper outbreaks from raccoons or dogs let off-leash by visitors have caused declines of foxes on this island, but a vaccination program has been initiated to protect foxes from the disease.